Departement of Var - Population: 60,968 h - Surface area: 2,217 ha. 5 km west of Toulon via the D559. La Seyne sur Mer lies at the foot of Cape Sicié. 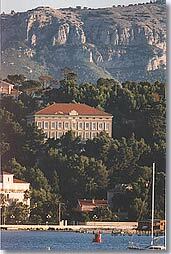 This southern Provence maritime town looks out onto Toulon bay and the open sea. 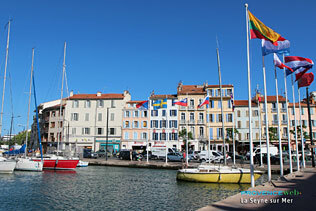 Historically La Seyne was a centre for the ship-building industry. The shipyards and forges brought great prosperity to the town for many years. Times have changed since then - that period has now ended - but this strong ship-building tradition should not cause the visitor to overlook the fact that La Seyne has a rich heritage and is also a very pleasant seaside resort. One of the most beautiful parts of La Seyne is the Tamaris corniche. From here there are wonderful views, and you can also admire the beautiful villas that are reminders of La Seyne's glorious past. This corniche and the residences along it were popular with many artists in the late 19th century: Renoir, d'Annunzio and Georges Sand among the most well-known. Here you will also find surprising and very beautiful villas built in the Moorish style, with minarets and roof terraces. One of the finest (you can't miss it, it's the whitest) is today home to the marine biology institute of Lyon University. The town centre is pleasant, with welcoming shops and lively pedestrian streets, especially in the summer of course. As you stroll around, you will come across a number of frescoes that embellish the town (including one by Vasarely at the Hôtel de Ville). You will also no doubt notice the very fine 19th century campanile that tops the church of Notre Dame. The historic centre is very picturesque, with its old houses and their fading colours, narrow streets and shady squares. In this town of seafarers and fishermen, the fish market is not to be missed, every morning on the quayside selling the day's catch. At La Seyne sur Mer there is sunshine, beaches, fine sand ... and so sunbathing, swimming and relaxation are definitely on the menu. Salettes beach has been completely redeveloped and now provides a very fine beach worthy of the finest seaside resorts. 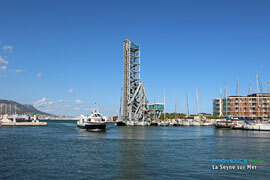 If you prefer to walk around, you can stroll along to the little harbour of Sainte Elme. Another very pleasant walking route takes you to the former mussel beds. 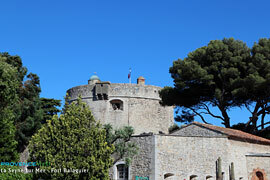 Fort Balaguier was built in 1636 as a cannon tower to protect access to the little bay. A gunpowder store was added, then ramparts, and finally living quarters, making it a fort where soldiers could be garrisoned to defend the town. Today it is a listed historical monument housing the Municipal Naval Museum, which presents the history of the merchant navy in the Mediterranean, and the history of the prison (there were nearly 4,000 prisoners here in the mid-18th century, including the famous François Vidocq). 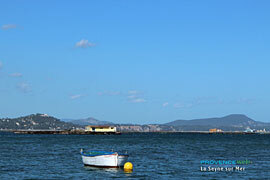 Its uninterrupted view of Toulon bay make it a particularly popular place for a stroll. This superb 3,800 m² building standing on the Tamaris corniche dates back to the late 19th century, and was owned by Michel Pacha. He was the great initiator of La Seyne's development as a seaside resort, particularly by draining the marshland (where the tamarisk used to grow). Today the villa named after him is home to a museum of Modern Art, making available conference rooms and organising exhibitions for visitors. The old town. 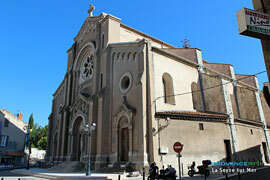 Notre Dame du Bon Voyage Church. Fort Napoleon. Naval Museum. Villa Pacha Tamaris. Corniche Bonaparte. Baraguier Fort. Aiguillette Fort. Walking: tour of the corniches, waymarked forest footpaths. Fine sand beaches. Tennis. Horse riding. Nautical sports. Hotel mythique du début du 19ème siècle situé directement sur la plage avec vue imprenable sur la mer. Entièrement rénovées, les spacieuses chambres et suites de ce monument historique offrent une vue à couper le souffle. 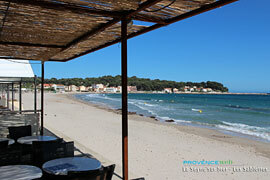 Six Fours les Plages (5 km), Sanary (9 km), Ollioules (7 km) and Saint Mandrier (9 km).